Bethesda Rewarding Parents That Name Children "Dragonborn"
Bethesda doesn't want Dragonborn to exist only in the Elder Scrolls games. Bethesda is holding an intriguing contest for parents planning to have a child by the end of 2011. If the birth of that child coincides with the release of Elder Scrolls V: Skyrim, and the child is named after the game's main character, Bethesda will provide the parents with a special reward. Bethesda's Pete Hines says that now is the time to conceive if you want a chance at winning. The "unknown" reward will only go to parents of a child born on November 11, 2011 that is given the name "Dovahkiin." "Dovahkiin" means "Dragonborn" in Skyrim's dragon alphabet, a language designed just for the game. 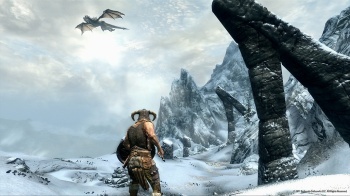 Players of Skyrim take on the role of a Dragonborn, who can use the powers of the dragons against the massive beasts. In the real world, it might not be as cool a title. It's sort of a joke and an unofficial contest, at least compared to the one run by Acclaim for Turok: Evolution in 2002 where it offered $10,000 to parents that named their child Turok. A disclaimer reads: "Any reward for completing this quest will not ultimately justify the potential teasing your child could - and probably will - endure over its lifespan. Bethesda Softworks is not responsible for your parenting." Bethesda's reward is a mystery, the name in this case is a lot stranger, and the child has to be born on a specific date, so it'll probably be tough for parents to go along with the contest. When it comes to Elder Scrolls fans, you just never know.